Dinosaurs are all the rage! Given their mysteriousness, grandness, and spine-tingling ferocity, not hard to see why. My kids, like many others I'm sure, are obsessed with dinosaurs and anything dinosaur related. But sadly, haven't had the opportunity to stand below a jaw-dropping a T-Rex exhibit and behold just how majestic they once were. But let's get one thing straight. This ain't some stuffy museum we're talking. No. These dinos move! 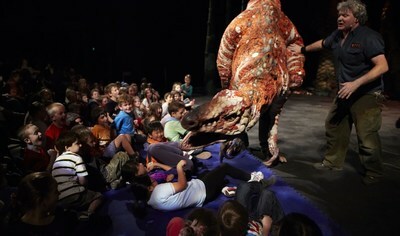 This exhilarating show, with it's large-scale dino puppets will widen eyes, dampen foreheads, and leave lollipops unlicked. 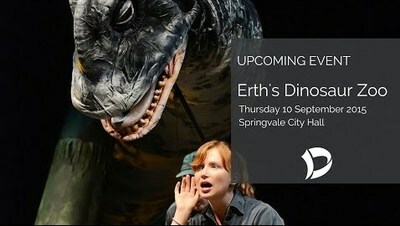 Featuring a range of prehistoric creatures, including cute baby dinos, to impressive, sharp-toothed carnivores (some of the largest carnivores to walk the "Erth") and Meganuera Monyi (largest flying insect, luckily pre-Mortein), this show will mesmerize. Critics have described this dino exhibition as an "extraordinary spectacle" and "very clever, beautifully constructed and hugely entertaining". With it's cutting edge puppetry and skillful presentation, you'll think you've traveled back in time, or perhaps a galaxy far, far away. WHERE: Springvale City Hall, 397-405 Springvale Road, Springvale VIC 3171. WHEN: Thursday 10th September, 12pm & 6.30pm. COST: All tickets $15 (parking free). TO BOOK: HERE or phone 8571 1666. FURTHER DETAILS: please visit website above.